Reading aloud to children is one of the best ways to expose them to Spanish. Illustrations and the context of a story help create comprehensible input, so kids understand and learn new words. 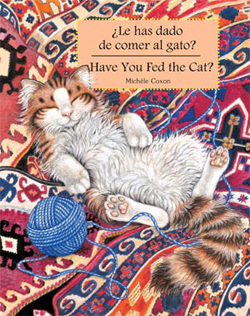 These Spanish read aloud books are excellent choices for language learners. I choose my read aloud books carefully. Native speakers of all languages have extensive vocabularies when they are very young. Many picture books have too much language and not enough visual support for children learning Spanish as a second language to understand the story. 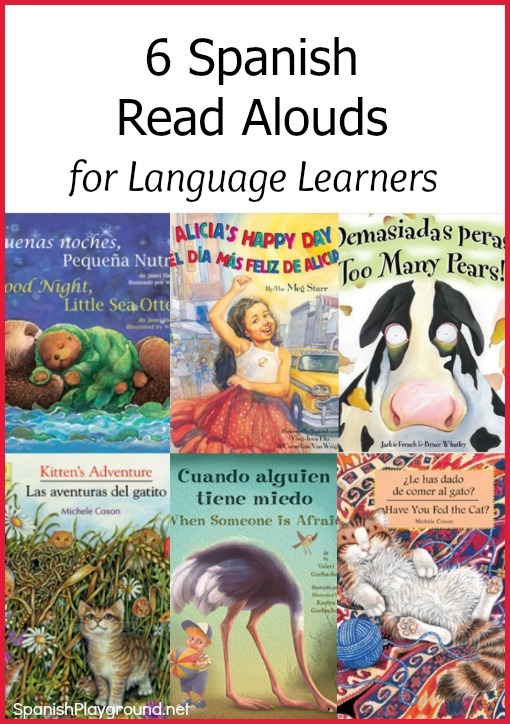 What is appropriate for a child depends on the her experience with the language, but all these titles have features that make them good Spanish read aloud books. Patterns – Patterns give kids the opportunity to hear a structure repeatedly, and repetition helps them understand and remember. Patterns also let children predict what comes next at the sentence level and at the story level. This is important because prediction aids comprehension. Rhythm, rhyme and emotion. – Children absorb the sound of the language from Spanish read aloud books. I look for books that make the most of the natural beauty of the language. Dialog is also a plus. Illustrations that support the text. – I look for illustrations that help clarify what is happening in the story. Since I am reading the story aloud, I can point to the pictures and add clarification, but the key parts of the narrative need to be represented. Detail-rich illustrations – In addition to supporting the meaning of specific vocabulary, illustrations with lots of detail lend themselves to observations and conversations related to the story. They are a wonderful resource for teaching language. A base of familiar vocabulary – Kids enjoy and learn from a story when there are familiar words to help them construct meaning. New vocabulary – Reading should be fun, so very few books are too easy to be worth reading. Almost all books will teach children some new vocabulary. However, I do look for stories with new, useful words. A variety of verb tenses – I read stories that use verb tenses naturally and don’t limit children to the present tense. Although kids will not produce a range of tenses immediately, it is essential that they hear them in context. This post contains Amazon affiliate links. If you click through and make a purchase, Spanish Playground receives a small commission. These books are published by Star Bright Books, and all of them have the features I mentioned above. I’ve listed them roughly in order of difficulty. 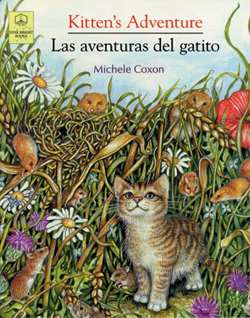 Las aventuras del gatito / Kitten’s Adventure by Michele Coxon follows a kitten as he finds the animals around the farm and then his own family at bedtime. The entire book is structured around the essential question ¿Dónde está(n)…? Michele Coxon’s delightful illustrations are rich with color and detail. There are animals to find and count and spark a child’s imagination. This is an excellent choice for young Spanish learners. 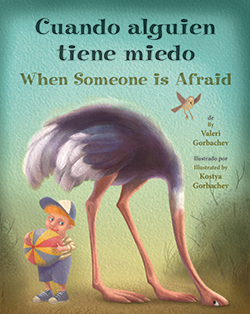 Valeri Gorbachev’s Cuando alguien tiene miedo / When Someone is Afraid describes what different animals do when they are afraid. For example, Cuando la jirafa tiene miedo…huye lo más rápido que puede. Or, Cuando los cuervos tienen miedo…se alejan volando. Cuando la ardilla tiene miedo…sube a un árbol a toda velocidad. The animals flee to specific places, such as en su aguero, bajo la cama, or en la charca, and the illustrations show each of these places clearly. The pattern, accessible vocabulary and illustrations that clearly show the meaning of the text make this a good read aloud for children learning Spanish. ¡Demasiadas peras! 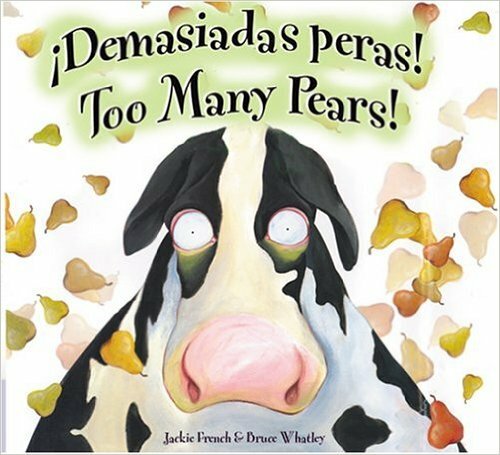 / Too Many Pears by Jackie French gives kids great exposure to gustar in the imperfect tense as it describes Pamela the cow. Children will laugh at Pamela’s extreme passion for pears and at her owner’s solution. The sentences in the story are short with plenty of familiar vocabulary. This book is a good choice for exposing kids to a simple past tense narration. 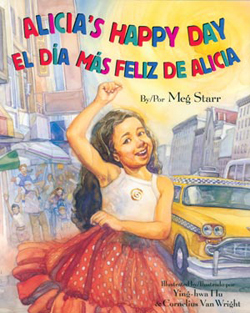 I love Alicia’s Happy Day / El día más feliz de Alicia by Meg Star for talking about neighborhoods. The story follows Alicia around her neighborhood on her birthday and wishes her a perfect day in the place and with the people that matter most. The story begins with a very common structure with Ojalá – ¡Ojalá que pases un día muy feliz! – And then continues with the just-as-common shortened form, Que oigas salsa y empieces a bailar. The entire joyful book follows this pattern as Alicia enjoys the sights, sounds and people who make up her world. The lovely illustrations correspond closely to the text and also give teachers and parents plenty of material to discuss with kids. 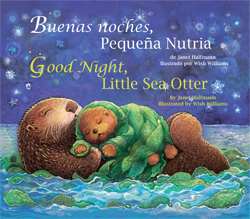 Buenas noches, pequeña Nutria / Good Night, Little Sea Otter by Janet Halfmann is a sweet goodnight story with a familiar pattern. Pequeña Nutria wants to say goodnight to all the different sea animals before he goes to sleep. They all wish him goodnight and he is finally ready to sleep. This is an excellent story to read if you teach a sea theme; it includes a wonderful selection of ocean creatures. The colorful illustrations are full of detailed animals that also look decidedly friendly and happy. ¿Le has dado de comer al gato? / Have You Fed the Cat? ¿Le has dado de comer al gato? / Have You Fed the Cat? By Michele Coxon is one of my favorite Spanish read alouds because it has a family setting with lots of useful vocabulary and quite a bit of dialog. In the story, Sami the cat realizes that the family pays attention to him when he asks for food. Soon everyone is feeding him, without knowing the others are too. There are patterns in the text, and kids love the illustrations of Sami inserting himself into whatever the family is doing. These Spanish read aloud books are at different levels, but language learners enjoy them all. The patterns, illustrations and familiar vocabulary let kids draw on what they know. Then, they can use that base to understand new vocabulary and verb forms to keep their language skills growing. Disclosure: The company sent me copies of the books to be able to write the article. All of the ideas and opinions are my own.